Academics and experts from across the nation gathered at Brooklyn College on Nov. 30 for “Weathering the Storm: The Caribbean, Puerto Rico, and the Diasporic Communities,” a daylong conference on the effects of and responses to this year's hurricane season—the worst on record. 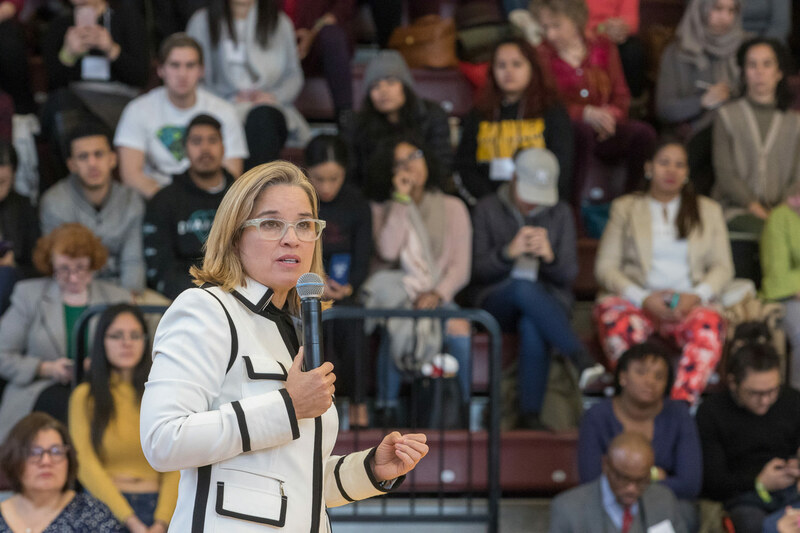 Honorable Carmen Yulín Cruz Soto, mayor of San Juan, Puerto Rico, delivered the keynote address at the event, which was sponsored by Brooklyn College and the CUNY Mellon Faculty Diversity Career Enhancement Initiative, in collaboration with the college’s Department of Puerto Rican and Latino Studies. San Juan, Puerto Rico Mayor Carmen Yulín Cruz Soto addresses the crowd at the West Quad Center gymnasium. 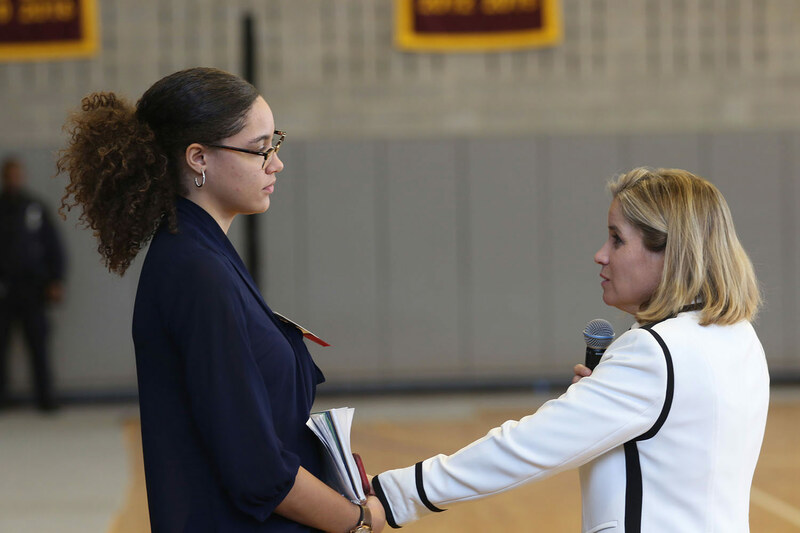 Mayor Cruz Soto holds hands with a student who expresses concern for Puerto Rico’s fate. A group of Puerto Rican women display the island’s flag with pride to welcome Mayor Cruz Soto. 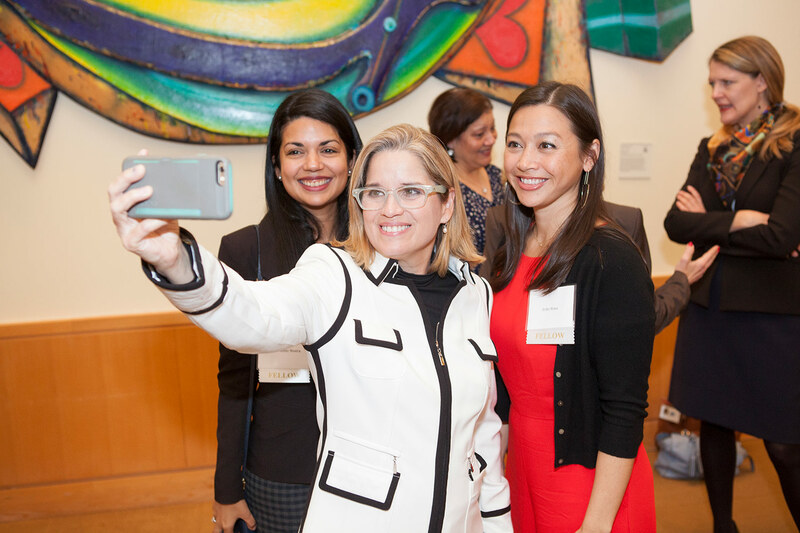 Mayor Cruz Soto takes a selfie with Ester Rivera (left) and Erika Niwa in the Christoph Kimmich Reading Room, Brooklyn College Library. Mayor Cruz and members of the Puerto Rican and Latino Studies Department. 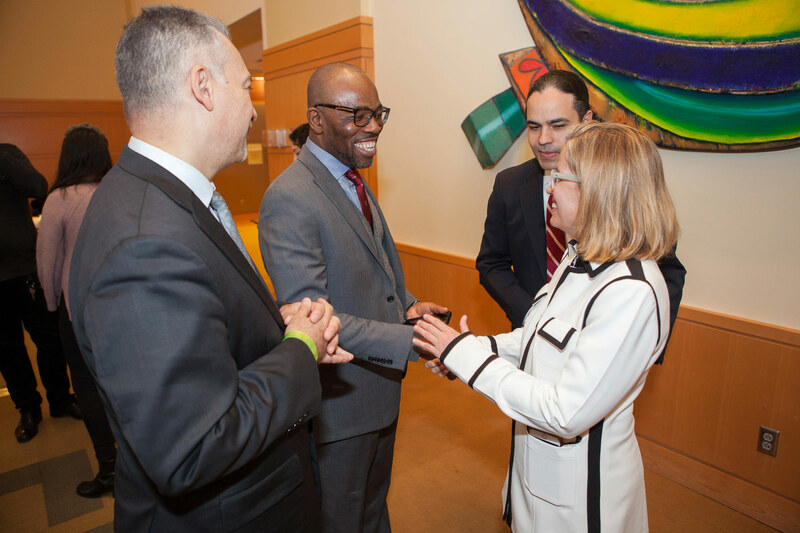 Professor Jean Eddy Saint Paul, director of the CUNY Haitian Studies Institute at Brooklyn College, welcomes Mayor Cruz Soto. 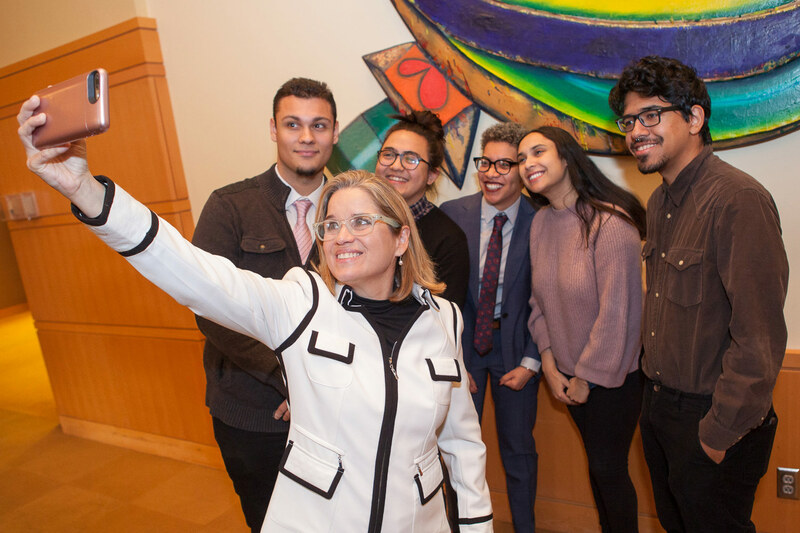 Mayor Cruz Soto takes a selfie with students. 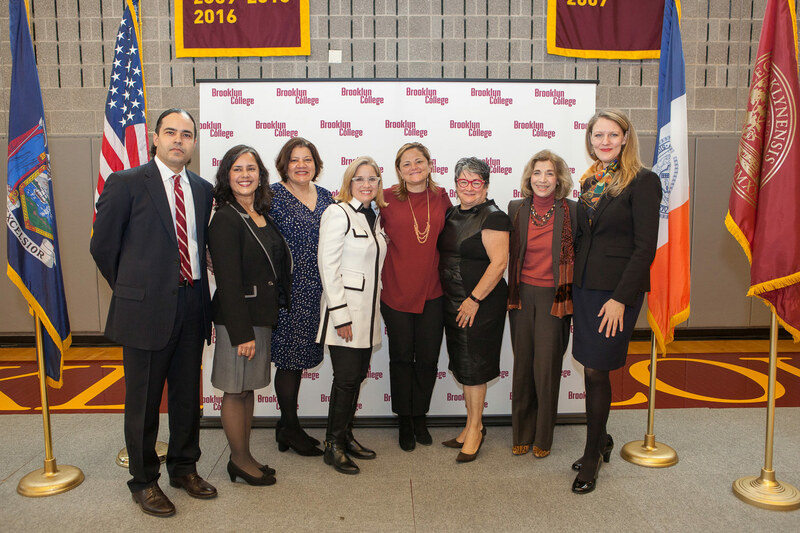 From left: Professor Reynaldo Ortiz-Minaya,; Dr. Maria Pérez y González, chair of the Puerto Rican and Latino Studies; CUNY Dean for Recruitment and Diversity Arlene Torres; Honorable Mayor Carmen Yulín Cruz Soto; Honorable NYC Council Speaker Melissa Mark-Viverito; CUNY Board of Trustees Lorraine Cortés Vásquez; Executive Vice Chancellor Vita Rabinowitz; and Brooklyn College President Michelle J. Anderson. Mayor Cruz Soto discussed in detail the current needs and challenges of Puerto Ricans, as they work to recover from Hurricane Maria, which tore through the island this September and was the strongest storm to make landfall there in 85 years. She noted that about 90 percent of people have drinking water and about 50 percent of the population has electricity, but that most of the hospitals in Puerto Rico are still running entirely on generators, “which of course are dropping like flies because they are not made to withstand weeks and weeks and weeks, 24 hours of day,” she said. 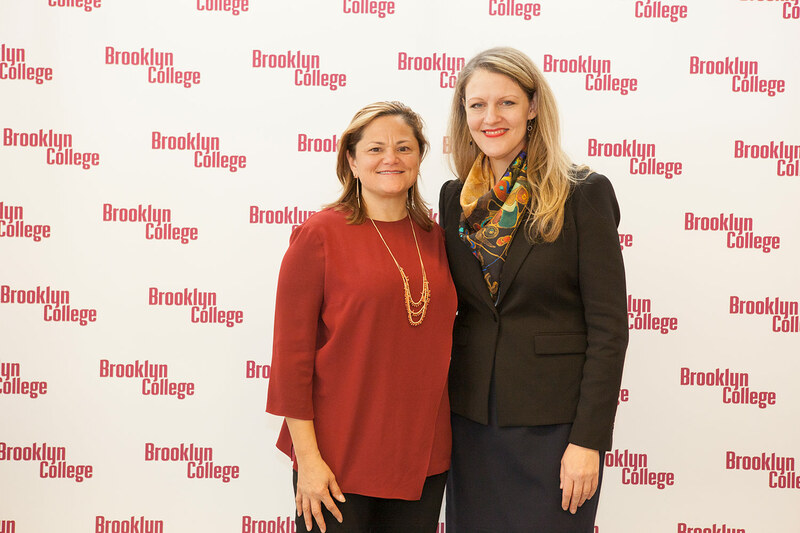 Following the keynote address, the program continued in the Brooklyn College Student Center with a series of panels, such as “Feeding Our People” and “(Re)Building Resilient Communities.” Other special guests included: Melissa Mark-Viverito, speaker of the New York City Council and council member of the 8th District of Manhattan; CUNY Board of Trustees member Lorraine Cortés-Vásquez; CUNY Executive Vice Chancellor Vita Rabinowitz; City College President Vincent Boudreau; and Jonathan Soto, executive director of the Mayor’s Center for Faith and Community Partnerships, representing Mayor Bill de Blasio. 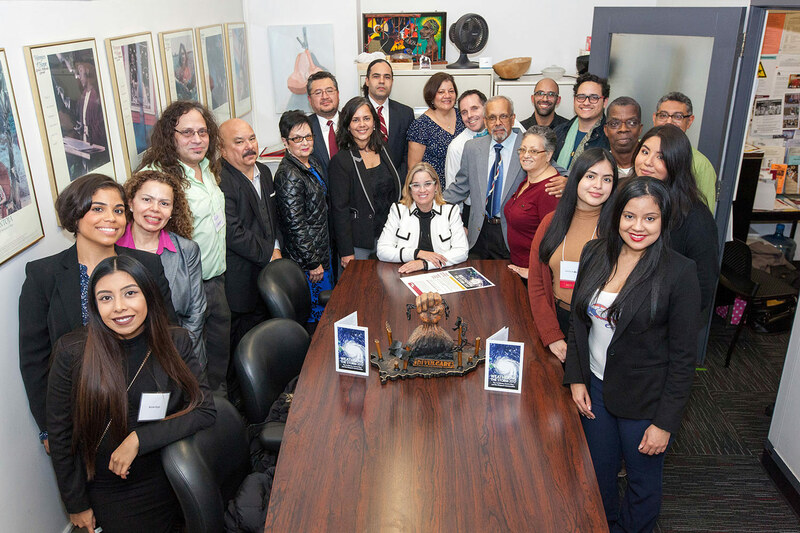 "Weathering the Storm" was made possible by the efforts of many individuals and groups, especially Professor Reynaldo Ortiz-Minaya of the Department of Puerto Rican and Latino Studies, the Puerto Rican Alliance (PRA), the Mexican Heritage Student Association (MHSA), Movimiento Estudiantil Dominicano (MEDO), Brooklyn College Mellon Mays Undergraduate Fellowship Program, Haitian Studies Institute at Brooklyn College, the Office of the President of Brooklyn College, the CUNY Office of Recruitment and Diversity, the CUNY Mellon Faculty Diversity Career Enhancement Initiative, and the CUNY Office of the Executive Vice Chancellor and University Provost.